It can also be used to indoctrinate and spread untruths. I know of one primary school teacher who is adamant. The tsunami was caused by global warming. That’s being taught to kids. So how are you going to educate children that the predictions have failed? Are you going to teach them basic science that theory, predict, test, fail means the theory is wrong? Are you going to teach them that science isn’t consensus.Its not a vote. 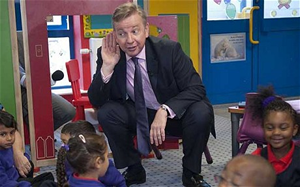 Are you going to teach them that the BBC is biased in favour of GW, because its pension fund is invested that way. So they get the head of comedy to approve breaking the law? Nah, you just want to indoctrinate. Teaching children about the planet they live on is an important part of any education. The precautionary principle is also an essential life lesson that is not hard to understand. This is true regardless of any individual’s personal understanding (or lack thereof) about how scientific consensus should work in relation to public policy, and the meaning of healthy scientific scepticism in relation to climate change, cancer, homeopathy or any other context. They can get on to Karl Popper at GCSE. Some day threatening children with CO2 death threats and promising them the greenhouse gas ovens of an exaggerated climate crisis will the crime that it is. Only the same lab coats of science that gave us pesticides and pandering politicians and neocon-like fear mongers and lazy copy and paste news editors still cling to this 28 year old “maybe”/”could be”/”might be” climate blame crisis. *Science DOES NOT agree climate change is a crisis, they agree it “MIGHT” be a crisis and it’s been 28 years. *Find us one single IPCC warning that says a crisis is “imminent” or “eventual” or “unavoidable”. *Science can say a comet hit is real but they can’t say their own comet hit of an emergency is as real as a comet hit. *What has to happen now for science to end this costly debate to save the planet and simply say a crisis is certain, not just another unsustainable 28 years of “maybe” crisis actually happening? When it comes to the ultimate emergency science must be about certainty not “could be” and if “maybe” is good enough to condemn your own children with CO2 death threats……………………………did Bush condemn billions to the greenhouse gas ovens of an exaggerated crisis? *Science has never agreed it WILL be a crisis, only could be a crisis and it’s been almost three decades. *Not one single IPCC warning has ever said any crisis WILL happen, only 28 years of “maybe” a crisis. Prove me wrong. *Obama had not mentioned the crisis in two State of the Unions addresses. We have become the new fear mongering neocons because did Bush condemn billions of children with CO2 death threats of an exaggerated crisis? Teaching children to LOVE the planet is the goal, not fear mongering them with our CO2 spear of climate change crisis fear stuck in their backs. We cannot continue to love the planet with fear like witch burners. Popper at GCSE – no problem. However what is taught at primary level has to be science that has passed the Popper test, otherwise it is indoctrination. Since the beginning of the 20th century global temperatures have increased quite a lot. A majority of scientists agree that burning coal and gas and driving petrol and diesel cars has contributed to this change. A small number of people talk very loudly about the possibility that scientists are wrong about the world getting hotter because of cars and power stations. This is a similar type of situation to previous arguments about the ozone layer, tobacco and asbestos (see chapters x, y and z). Asbestosis – Theory – test – causal link established. eg. Animal expirements. Tabacco – Theory – test – bad for the beagle – link established. Ozone – Hmmm, bit more dodgy. The hole is a bit smaller that people imagine when you see the percentage ozone graphs, but even here their is a test. Ban CFC’s and watch the drop. Global warming. Theory – Predict – Test and fail. That’s the crucial diffrence. The first 3 have met the experiment and prediction test. GW has failed and so is falsified. People are still arguing against the ‘consensus’ on both asbestos and tobacco. Where they can’t argue with the science, they suggest that mitigation policies and regulation are too expensive, or are ineffective. If that doesn’t work, they change the name, or alter the product in a minor way. (White) Asbestos is now called chrysotile and still banned in the US and many western countries, but is sold around the world with a range of ‘opinions’ about its safety. There are numerous articles and papers about why smoking reduction policies are inefficient, and wider protestations about ‘free speech’ and marketing even in the UK which has pretty advanced attitudes in this area. Unfortunately, the philosophy of science is much more complicated than you would like it to be, and I would hope that any GCSE exam on Popper would not be multiple choice. To be honest, you know where to find the scientific consensus on this, so I’m not going to repeat the whole argument for why you are wrong in a paragraph. If you want to ignore it all to pay attention to the scientific equivalents of ‘the 9/11 truth movement’ and David Icke that is fine by me. As far as I am concerned it is much more important to make sure that policy makers understand the reason for being cautious with what their policies support, even in the face of dissemination. This includes encouraging kids to understand the risks of cause and effect, and why it is better to err on the side of caution – particularly when their actions may be irreversible. They may be arguing on Tabacco or asbestos, but its clear. There is a theory, it makes predictions, and it can be tested in both cases experimentally, and the results show a clear causal link. However, if you accept that as a scientific method then the same applies to climate theories. Those theories have made predictions, they consensus predictions are in the IPCC reports. They have been running for long enough that they can be tested. They have been falsified. Temperatures are below their predictions by a significant margin. So even as we speak, predictions are being lowered and lowered. A sure sign of a fundamental problem. Not much of a dispute actually. Within the scientific community there is no dispute about mankind’s influence on climate. No respected climate scientists are putting forward cases against mankind’s influence on climate in peer reviewed journals. The “dispute” is entirely conducted in the media by the climate change deniers. The climate change denial is a media phenomenon funded and promoted by in various ways by hugely wealthy groups with a vested interest in undermining the scientific community. Thick right wingers are simply mirroring the views of the very wealthy climate change denying groups. It is obvious you just made up the story about the primary school teacher. Global warming theories are based on observed change over centuries. Currently there are no respected climate scientists putting forward oppositions to climate change theory in peer reviewed journals. Climate change denial comes from hugely wealthy groups with a vested interest in undermining the scientific observation. Climate change denial is a media phenomenon, not a scientific one. You are just to stupid to see that. The climate change phenomenon is observed over centuries. The one thing all climate change predictions have in common is that accuracy is only likely over very lengthy periods of time. A pause in apparent global warming of 40 years is within the scope of the climate change predictions. Different elements of the planet can, “take the heat” if you like, for very lengthy periods and thus produce an apparent pause, but the underlying phenomenon continues and climate change scientists have the ability to observe this. The apparent consensus is distorted by vested interests and BBC only covering one side of arguement. There is good and bad science on both sides of arguement. But this IS just a political game! There is no scientific evidence that global warming is man-made. It is known by the scientific community to be a natural process, we are exiting an ice-age, of course its getting warmer. The real issues are plastic pollutants and habitat loss/human encroachment, global warming is a deliberate distraction from those important issues. There won’t be any life left to conserve if we don’t address the real issues soon, instead of following celebrity trends like the global warming ‘debate’! 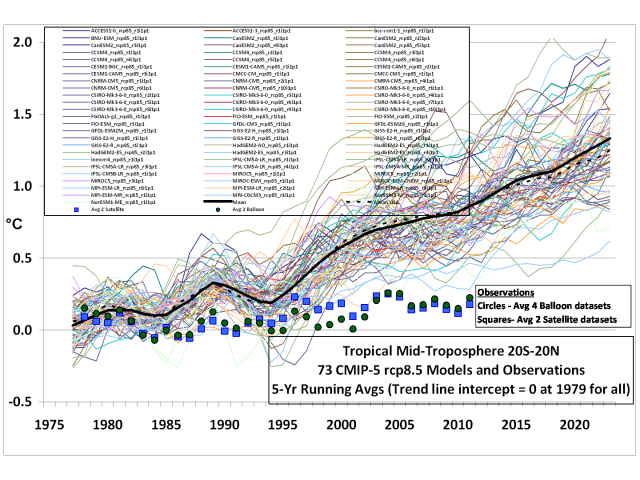 So what were the temperatures in the MWP, and what are they now? Difficult one that, since in the MWP, temperatures were higher. Why have all the IPCC predictions been wrong on the high side? Again a difficult one, since its standard science. Theory – predict – test. In the case of AGW, the test of the prediction is a fail. They have over estimated. If we take the Met Office. Look at their climate predictions for the UK. They have over predicted the temperatures. Binomial distribution and a coin toss 50-50% chance of being right as the comparison, and the chances they are right, 0.2% They are to put it mildly, crap at the prediction game. The reason is quite simple. They have taken money on the basis of AGW. So they have to come out with warmist predictions, or its not good salesmanship. However, theory, predict, test, again a massive scale on more than they typical 5% chances of being wrong. It’s down to 0.2%. I take it you’re one of the green entrepreneurs harvesting poor people’s money by forcing them to overpay on the electricity, petrol, holidays, central heating, … A reverse Robin Hood, robbing the poor to fund your life style. Yep, must be. Well, they put in confidence intervals. If the temperature goes outside the confidence intervals, then its falsified. Crude but reasonable accurate. The longer its outside the confidence intevals, its completely falsified. Even it its below the prediction most of the time, the prediction is also falsified. There was an interesting report written that showed many think tanks that were against global warming theory were heavily funded by the energy markets. What would be interesting to know is what reports and think tanks say what and who they are funded by. Best logical guess would be the independent ones will generaly be the most truthful. And Tim Yeo’s in favour of GW, because he’s receiving money off the back of it. Like Gore. Neither changes the reality. It’s pretty damning evidence when so many variations of the GW theory fail to make a prediction that’s accurate. Rubbish. There is an overwhelming scientific consensus on this. The BBC should not be providing ‘balance’ on ideas that are clearly loony. Er, most of the people who claim manmade global warming isn’t happening are on the payroll of companies who have a vested interest in claiming it’s not happening, eg Exxon. Plus the usual crazy ideologues, of course. Wow, sounds like you’re a real scientific expert. What have the euro got to do with it? We are talking about scientists here. Should we believe them, or a bunch of right wing nutjobs? On a separate note, did you know that if one of your hands is really cold and the other is really hot and you put them in tepid water one will feel hot and the other freezing cold? Subjective judgement is a funny thing.